ScJ Training is a registered centre with Qualsafe Awards – Centre Number 904770 and is able to deliver a complete range of First Aid Courses to suit your needs, be they in the workplace, voluntary sector or because you feel that you should have some form of First Aid Training. Recently we have added our own -F / Forestry First Aid Course for those working with chainsaws or forestry machinery. We have a new online calculator that can be used. 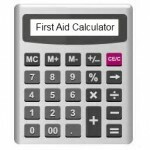 Please click the calculator icon below to access it (if you need assistance with your risk assessment please contact us as we would be happy to help).